If you’ve got a child in elementary school, chances are you’ve seen a hundred chart. Lots and lots of hundred charts. Hundred charts are so useful, and they’re also A LOT of fun. 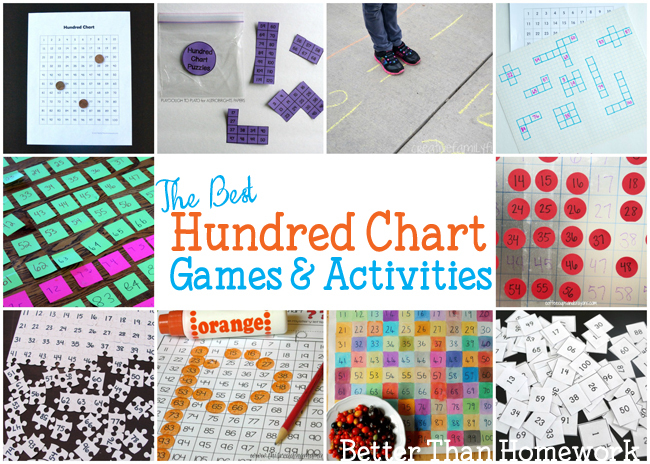 Check out all of these awesome Hundred Chart Games and Activities. You’ll love them and your kids will have lots of fun learning! What is a hundred chart and why do we use it? This post offers a great explanation about why hundred charts are such great learning tools. Can you put a hundred chart back together? Try this fun puzzle game, Wacky Mixed Up Hundred Chart. Take it outside and play with a huge Driveway Hundred Chart. Creative Family Fun shows you how to make one and some fun ways to play. Fill in the missing numbers with this fun hundred chart puzzle at Creative Family Fun. This is such a fun idea! Make a big, hands-on sticky hundred chart from Coffee Cups and Crayons and go on a scavenger hunt to find the missing numbers. Create some colorful Hundred Chart Puzzles like these from Playdough to Plato. This is such a fun and simple game to have on hand. Combine math with art when you create 100 colors to make a colorful hundred chart from NurtureStore. Uncover a missing letter in your hundred chart. Find these printable Mystery Letter Hundred Chart printables at This Reading Mama. They’re a fun quiet time activity you can take anywhere. Turn a hundred piece puzzle into a hundred chart with this fun idea from Miss Giraffe’s Classroom. 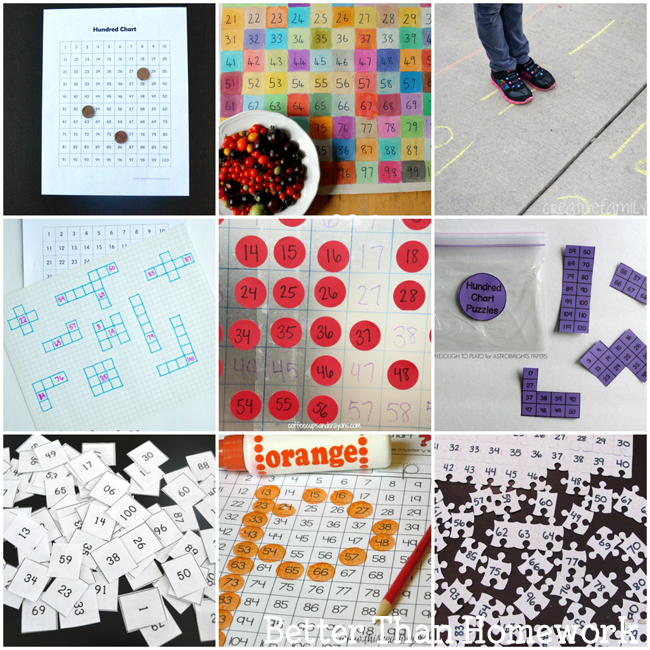 Check out the entire post for several more fun hundred chart activities. Make a hundred chart out of sticky notes. Check out Reading Confetti for inspiration. Turn your hundred chart into a game of Battleship with this fun idea from 123Homeschool4Me. Fun! Take colorful craft sticks and turn them into a fun Rainbow Math Hundred Chart from The OT Toolbox. 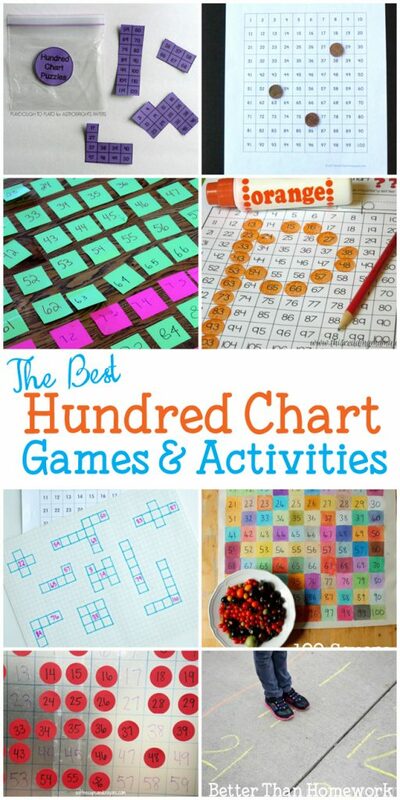 Which of these fun hundred chart games and activities do you want to try with your kids?